Volunteer Collections Centre guide Cameron Slater tells a fascinating story of what he believes to be the Star Car of the Show at the British Motor Museum. Star quality is a very rare thing. The X Factor and Britain’s Got Talent and The Voice spend millions every year searching for people who have it. From its very beginnings, the Hollywood film industry has based an entire philosophy of business, art and entertainment on the idea of “The Star”. Since then, every form of entertainment has had to have “The Star of the Show”, “The Top of the Bill”; today’s leading film actors are not just stars but megastars … and so the hype goes on. I was reflecting on this one day in the Collections Centre while I was gathering my thoughts for the 1.30 tour. What, I wondered, was our “Star of the Show”? The 1955 Bentley Continental Fastback? The Queen’s P5B Rover? The 1936 MG Magnette NB? The very last of the Issigonis Minis? Well, no – it’s none of these, and not even the very latest Land Rover Discovery either. 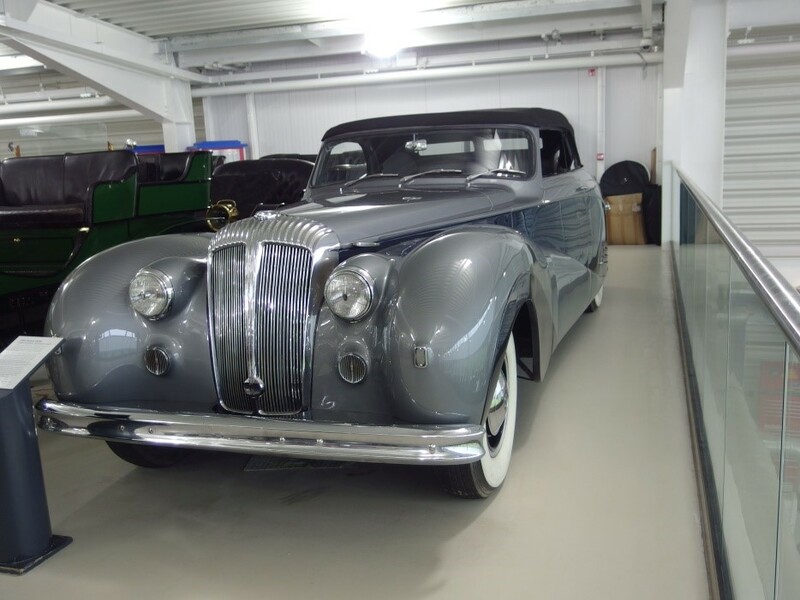 I decided that the real Star of the Collections Centre had to be the 1950 Daimler “Green Goddess” DE36 Drop-head Coupé, which is from the Jaguar Daimler Heritage Trust collection.' And I am not alone in this because it’s one of the cars about which we get more questions and comments than any other. Now this is hardly surprising. The car is a supercar long before the name was thought of. It’s enormous and magnificent with the flowing lines of its coachwork by Hooper, painted in a two-tone design of silver-grey and deepest blue and the hood is made from the best black mohair. It’s powered by Daimler’s own eight cylinder, five and a half litre engine which develops 150 hp and gives the car a top speed of …… 83mph!! This hardly compares with the 200mph plus performance of today’s McLaren or Bugatti Chiron, but the Daimler is not made for speed; it’s made to be a statement about real star automotive quality and in any case, it weighs in at a shade under three and a half tons. You only have to open one of its two doors to feel the weight and to appreciate the engineering that has gone into that wonderful, solid, metallic ‘click’ when you shut it. So there it sits, lording it over everything else around it. A Star. The information board tell us that it was one of seven such cars built to the design of the original Green Goddess (because it was painted green, since you ask). The Hooper-bodied Coupe was introduced at the 1948 London Motor Show although the DE36 chassis had been available since 1946. The first Green Goddess was run by Sir Bernard Docker, who was at that time the Chairman of BSA Industries, the owners of the Daimler Motor Company. Those of us who have reached a certain age will remember Sir Bernard and Lady Docker who were, I suppose you could say, the Posh and Becks or maybe The Kardashians of their day. Their extravagant exploits in the London social scene of the early fifties kept the gossip columns (and frequently the front pages) of the popular newspapers full of tales of a lifestyle that the rest of the country could scarcely imagine in their wildest dreams. Where our Green Goddess is chromium plated, theirs, I seem to remember, was gold plated and they tended to favour zebra hide and ivory for interior trimmings. All this in the early 1950’s when the country was still reeling from the after-effects of the Second World War and when just about everything was severely rationed. Nothing succeeds, as they say, like excess. But back to our information board which also tells us that the first owner of the Daimler was a New York opera singer called James Melton. Now I have been going to ‘The Opera’ since the early 1970’s and I know a bit about opera stars of the past, but I had never heard of James Melton. So I did some research and I discovered a Star in an Exorbitantly Priced Car (with apologies to Jeremy Clarkson). 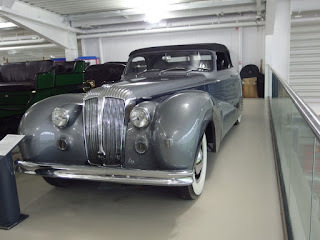 Our Daimler which James Melton bought and had shipped out to New York cost £7,000 in 1950. I looked this figure up in an inflation calculator website and the 2018 equivalent is £235,200. So this guy must have been some opera singer to be able to spend that kind of money on a car. Many hours of internet-surfing later, I discovered that he wasn’t just an opera singer – he was a popular recording star, a film star, a radio star, a television star, a concert singer and, yes, an opera singer; and it wasn’t just one car – it was a hundred cars and he owned his own motor museum, first as the Melton Museum of Antique Automobiles in Norwalk, Connecticut from 1948 until 1953 then as the James Melton Autorama in Hypoluxo, Florida until his death and the closure of the ‘Million Dollar Museum of Motoring Memories’ in 1961. So, yes, some opera singer! Melton was born in 1904 in Moultrie, Georgia. His musical abilities were obvious from an early age and developed during his time at Florida State University. He went to New York in 1927, determined to be a singer and joined a singing group called Roxy’s Gang at the Roxy Theatre. He then joined a vocal quartet called The Revellers as lead tenor and performed with them across the USA and in Europe until 1933. But from the late 1920’s he was also a recording star in his own right. He had a beautiful light lyric tenor voice of the kind that was very fashionable at that time. He recorded for the major record labels of the day - Brunswick, RCA and Columbia - with a repertoire that included such gems of popular sentimental song as I’ll Take You Home Again, Kathleen. In 1934 James Melton went solo and established himself on concert tours (including one with George Gershwin) and on network radio. However, as the thirties progressed, Melton’s style of singing began to go out of fashion and he found himself competing with a new, popular style of singing-star such as Bing Crosby. Melton continued to broadcast on national radio, but he knew his career was at a major turning point so decided to become an opera singer. Now, today, this would be a very unusual step, but Melton made it work. From 1938, he appeared in various regional opera companies in the USA, singing major roles in operas by Puccini, Verdi and Donizetti. His operatic career reached the heights when, in December 1942, he made his debut at the Metropolitan Opera in New York where he remained as a leading tenor until 1950. During the 1950’s, however, James Melton’s career went into decline. He had been a star in almost every form of musical entertainment, but time and alcohol began to take their inevitable toll of his voice and the huge popularity of singers such as Mario Lanza, Frank Sinatra, Bing Crosby and Perry Como meant that Melton gradually disappeared from the scene. As I said earlier, James Melton’s other passion was his fine collection of historic motor cars. He was, in fact one of the world’s earliest private collectors of historic cars, especially from the period the Americans call The Brass Era and we in Britain call The Veteran Era. By the time he set up his first museum, The Melton Museum of Antique Automobiles, in Norwalk in 1948, he had amassed about fifty-five cars as well as bicycles, car accessories, model trains and music boxes. As the collection grew, it became clear that the Norwalk museum had become too small and Melton built its replacement in Hypoluxo, Florida. So in 1953, the James Melton Autorama was completed and in typical show business style the cars were driven – under their own power - in cavalcade and with maximum publicity from Norwalk to the new building in Hypoluxo. The collection by this time numbered about a hundred cars, some of them extremely rare and important. The oldest was an 1893 Custom Steam Coach and the collection had a number of early steamers including a Stanley Steamer Mountain Wagon and a White Steamer. It also contained a 1900 Rockwell Hansom Cab which was thought to be the first New York City taxi, a fabulous 1913 Peugeot “Skiff”, - a Type 150, 4 cylinder, 40hp roadster with a 7478cc engine. Melton’s personal favourite was, apparently, a 1907 Rolls Royce Silver Ghost which had been the very first Silver Ghost to be imported into the USA. So I don’t think it’s a coincidence that, in the great days of his musical career, he often appeared in a radio show called The Firestone Hour which was sponsored by the Firestone Tire and Rubber Company; his own weekly radio show in the thirties was sponsored by Texaco; his weekly television show in the fifties was called The Ford Festival and was sponsored by the Ford Motor Company. And it was Melton who first sang Back Home Again in Indiana over the PA system at the opening of the Indianapolis 500 in 1946 which then became a tradition that continues to this day. The visuals accompanying the music include a photo of James Melton and friends, in front of the American Airlines office somewhere in New York, with our very own 1950 “Green Goddess” Daimler DE36 Drophead Coupe right there in the foreground of the picture – where the real stars always are.